Between Oct. 23 and Nov. 9, and in celebration of World Polio Day on Oct. 24, Rotarians across central Aroostook County are wearing purple polo “polio” shirts to spread awareness of Rotary’s End Polio Now efforts. Activities kicked off on Oct. 23 with the Mars Hill Rotary Club hosting Purple Pinkie activities at Fort Street School and Central Aroostook Junior/Senior High School. On Oct. 24, and in the week leading up to World Polio Day, the Woodstock Rotary Club in New Brunswick, held Purple Pinkie Project events at three Woodstock community schools—Meduxnekeag Consolidated School, Townsview School, and Woodstock High School. During their event at Townsview School, first grader Brody Hamilton, who had been collecting money through a social media campaign to help unfortunate people, decided to donate the proceeds from his work, $150, to the club’s Purple Pinkie effort. 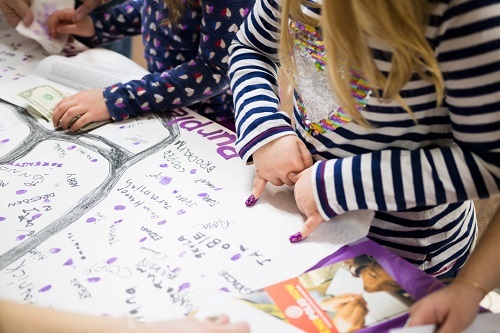 The Washburn Rotary Club hosted its first-ever Purple Pinkie Project at schools in Washburn on Oct. 24 and also offered a Purple Pinkie table during its Hunters Breakfast on Oct. 27. In addition, the Presque Isle Rotary Club hosts a Purple Pinkie station at Easton Junior-Senior High School on Nov. 6. At UMPI, in the Owl’s Nest, from 8 a.m.-4:30 p.m.
At the Northern Light A.R. Gould Hospital, at the A.R. Gould cafeteria, from 11 a.m.-1 p.m. Members of UMPI’s BioMedical Club will staff this table. 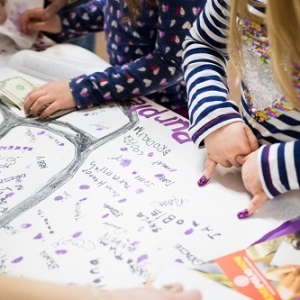 At the Mark and Emily Turner Memorial Library in Presque Isle, from 9 a.m.-5:30 p.m.
Also on Nov. 9, Presque Isle Rotarians will be on hand to host Purple Pinkie stations at Easton Elementary School, Mapleton Elementary School, Pine Street Elementary School, Presque Isle High School, Presque Isle Middle School, and Zippel Elementary School. A Purple Pinkie station will also be set up for employees at MMG Insurance (staffed by UMPI Business Club members). In addition, the Caribou Rotary Club will continue with its drive to support awareness of polio eradication efforts year round with club fundraising at each club meeting, and the Fort Fairfield Rotary Club and Limestone Rotary Club plan to host Purple Pinkie events later in the school year. This year’s activities carry on a tradition of raising many local dollars for, and even more awareness about, Rotary International’s efforts to eradicate polio. The first annual World Polio Day and Purple Pinkie Project event, held in October 2012, saw an estimated 1,000 people in the community participate and initially raised $1,250. An anonymous donation of $1,000, however, pushed the fundraising total to well above $2,000. Last year’s event raised $3,000 and saw an even greater number of community members participate. This year’s event is co-presented by UMPI and the Rotary Clubs of Central Aroostook, and is sponsored by Northern Light A.R. Gould Hospital, NMCC, and MMG Insurance. For more information, contact UMPI’s Community and Media Relations Office at 768-9452 or visit www.umpi.edu/worldpolioday.